I have been following the Pioneer Woman for some months now and I know for sure, for years to come. And maybe in my wildest dreams I will come to meet her some time. Just like I met recently David Lebovitz. Who knows. And why not, right? I've made some of PW's recipes like the cinnamon rolls and the rosemary buttered dinner rolls and over the weekend, I've embraced the pot roast! Yes Ree, I did! And I loved the simplicity of this recipe that I'd probably do it over and over again, until my family's pleadings that they're tired of it. It is perfect in every sense - preparation, taste and it even looked perfect on the plate! Thank you, Pioneer Woman! To make this perfect pot roast, you'll need a pot which you can put in the oven. I used a La Chasseur cast iron pot and the rest, should I say will perfectly fall into place. And here's the step by step in photos.... just like how PW did! Generously season the meat with salt and pepper on both sides. Heat the pot and add olive oil. Saute the onion until it the outsides are seared. Remove and place on a plate. Next, stir the carrots until it gets a bit of colour, just like what you did with the onions. Set aside. Next stop, the roasting meat. Sear until browned all over but not cooked through. Set aside with the veggies. After you sear the meat, pour about a quarter cup to 1 cup of stock into the pot to deglaze - that is to get all those flavours from the bottom of the pot. fresh rose mary... we had a massive shrub in our backyard! Add back into the pot, the meat first, then carrots and onions, and the rose mary and thyme if using. Pour enough stock to cover the meat - about 2-3 cups. Place lid on, and put in the oven to cook for 3 hours. After 3 or so hours, voila! Perfect pot roast! Seriously good roast! Simple, but packed full of flavour! I served this for Sunday lunch with some home made mash potato. 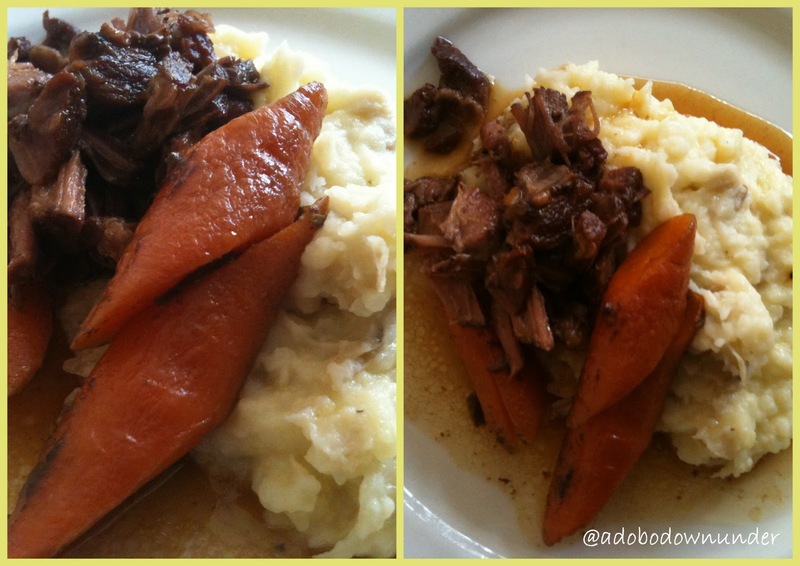 Shredded the roast meat, served on top of mash and some of that glaced carrots and onions! Hope you will embrace the pot roast like I did! This is new to me as most Filipino dishes are stove top and roasts such as chicken and beef are only made on special occasions. But how easy this is has left me to wonder why I never tried to do it before! Its so much like Julia Child's boeuf bourgignon. Now that I've taken the pot roast route, I'm not too afraid to try on the French classic! PS - Here's my simple mash potato consists of: 4-5 medium sized potatoes, boiled till tender and soft. While still hot, peel the skins off, add about 50g of unsalted butter cut into cubes, half a cup of milk, salt and pepper to taste. Mash with all you might using a sturdy masher. Add some chives for that extra colour and flavour!